If you’re looking for a great 4K action cam that’s remarkably compact but still manages to shoot stunning ultra HD video, look no further. 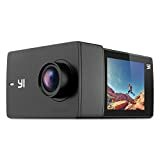 The popular Yi Discovery 4K Action Camera is on sale right now on Amazon, and it’s one of the best options in its class. This nifty compact camera supports eight different shooting modes including 4K/20fps and 1080p/60fps. It also uses a Sony IMX179 image sensor with a 150° wide-angle lens, and it can capture wonderfully crisp 8-megapixel still photos. Use the coupon code NW2UIST9 at checkout and you’ll pay just $47.99 for this great little camera.